"He's a very good young player." 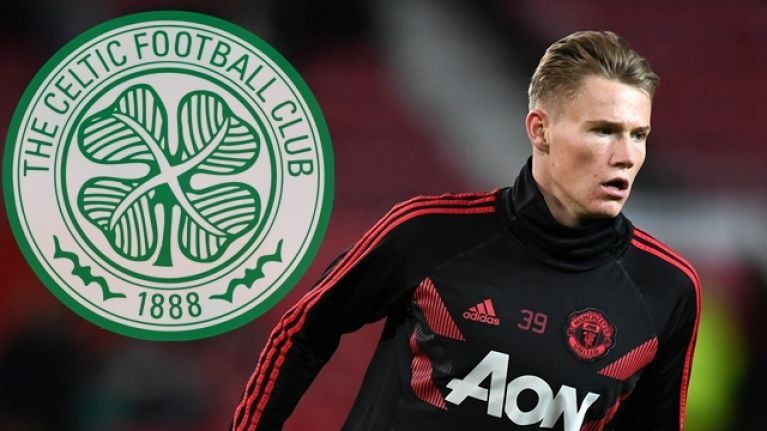 Scott McTominay could be about to join Celtic on loan from Manchester United. The Scottish midfielder, who came through United's academy, broke into the first-team at Old Trafford under Jose Mourinho and has made 33 appearances for the club. McTominay was a favourite of Mourinho, who started the 22-year-old ahead of Paul Pogba in the away leg of the Champions League last-16 tie against Sevilla last season. He spoke highly of the midfielder and the former Chelsea coach also used McTominay as a central defender in the loss to West Ham back in September. However, he could be surplus to requirements under Ole Gunnar Solskjaer. McTominay started the FA Cup third round victory over Reading at Old Trafford, but his only action in the league under the United caretaker coach came against Spurs last Sunday when he was introduced as a late substitute. His contract runs until 2021, with the option of a further year, and according to reports his immediate future could be away from Manchester. The BBC report that there is interest from several clubs. While Sky Sports claim that Celtic are in talks with United over a loan move for the player. Brendan Rodgers praised McTominay on Thursday, but wouldn't confirm the club's interest in the player. "There's lots of speculation around players, so I wouldn't comment," the Celtic manager said. "He's a very good young player. When he broke into the team at Manchester United, I think he showed that. He's a fantastic talent, but there's nothing more to say."